Cool on the ball, calm under pressure and an integral member of the meanest defence in Liverpool history, Alan Hansen in a red shirt was class personified. 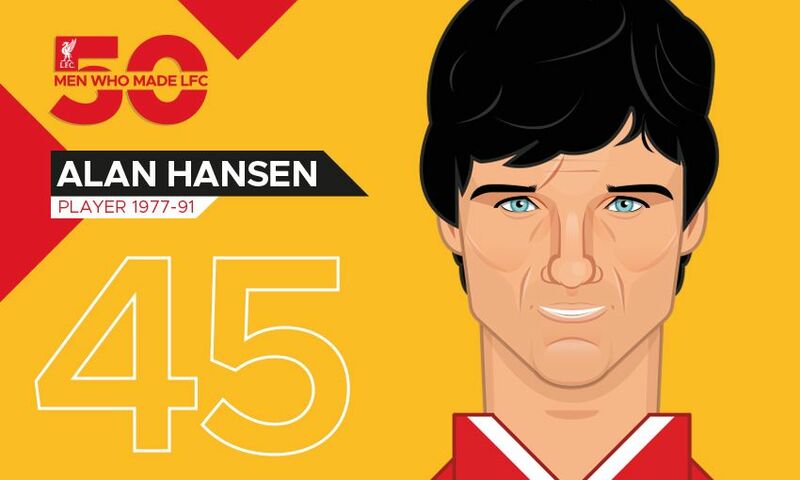 Rated by many as this club's finest ever central defender, Hansen was at the heart of the Liverpool back four for 13 years and can boast one of the most impressive medal collections in football. Relying on brain rather than brawn, very few centre-forwards ruffled him. A crisp tackler, his reading of the game was exceptional, while his graceful style was tailor-made for Liverpool's hugely successful tactic of patient build-up play from the back. His pace, control and vision was as effective in creating attacks as in stopping the opposition and he was at his most majestic when striding up field with the ball at his feet. A natural leader, he took over the captaincy in the summer of 1985, promptly leading the team to a coveted league and FA Cup double come the end of that season. He lifted a further two titles before a knee injury eventually curtailed his glittering career.